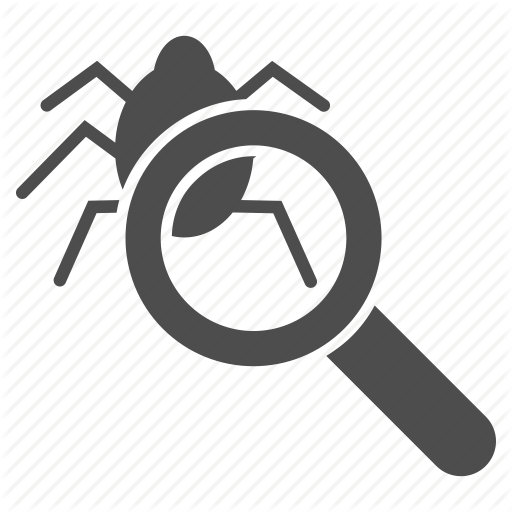 This tutorial should help you understand what the debugging is, how to use it, how to use ingame debugging command SpawnScriptDebugger() and generally, how to be selfsufficient in solving issues in your scripts. This tutorial is applicable on all scripting languages, not just NWScript. Debugging is a method how to find out what is really happening in your script, what are the variables' values and values returned from functions in your scripts. This is a main method of solving issues in script - debugging helps you find out why the script doesn't work the way you expected. After you know the reason, fixing the issue is easy. Most often, scripters are using some print function, in NWN1 this would be SendMessageToPC or WriteTimestampedLogEntry. Many scripters has their own debugging functions that uses combination of the above functions and/or has extra features such as print the message only if local variable DEBUG is 1 or something like that. For this tutorial I will be using a 4 custom functions of my own. These functions are inside inc_debugging attached to this tutorial. They don't have the "debug level" functionality so scripter is supposed to remove them after he makes sure everything works as supposed. We will be using them to make our scripts to debug what is going on in our script. So, assume we have a script or function that is faulty somehow. First we need to open the script in editor. I will use the balord ondeath fireball explosion, the script nw_s3_balordeth.nss as an example. //Get the spell target location as opposed to the spell target. //Apply the fireball explosion at the location captured above. //Declare the spell shape, size and the location. Capture the first target object in the shape. //Cycle through the targets within the spell shape until an invalid object is captured. //Adjust the damage based on the Reflex Save, Evasion and Improved Evasion. // Apply effects to the currently selected target. //represents the flame that erupts on the target not on the ground. //Select the next target within the spell shape. Lets say the script is not applying damage and you want to know why. the explosion found 3 targets in AoE. With these informations we should now know what the bug is or at least which function causes it. In our case the script seems ignoring Spell Resistance and the bug is somewhere inside the function MyResistSpell. This will give us the actual value of the MyResistSpell. (This will print value 0) or we can apply debugging into MyResistSpell. I won't follow further in this example as the issue here is known - it is because vanilla function ResistSpell returns -1/0 when used outside of the spellscript. Ie. this will never work and if you would want to make it functional you would have to make your own fake SR check. This should give you rough idea of how to use debugging in script and how to use the messages you get ingame to find and fix the issue. This methodology is applicable on all programming, you just need to use different functions and different means how to activate the problematic part of the code. IMPORTANT NOTE: This functionality is currently missing in NWN:EE and might not even be restored! So right now, this applies only for 1.69. This is the actual reason I am writing this tutorial. It seems nobody except me knows about it? 1) Use function SpawnScriptDebugger() somewhere in your script or inside function called by your script. The game client is stopped and the execution of the script is also stopped untill you loop the script step by step or you hit Quit button. 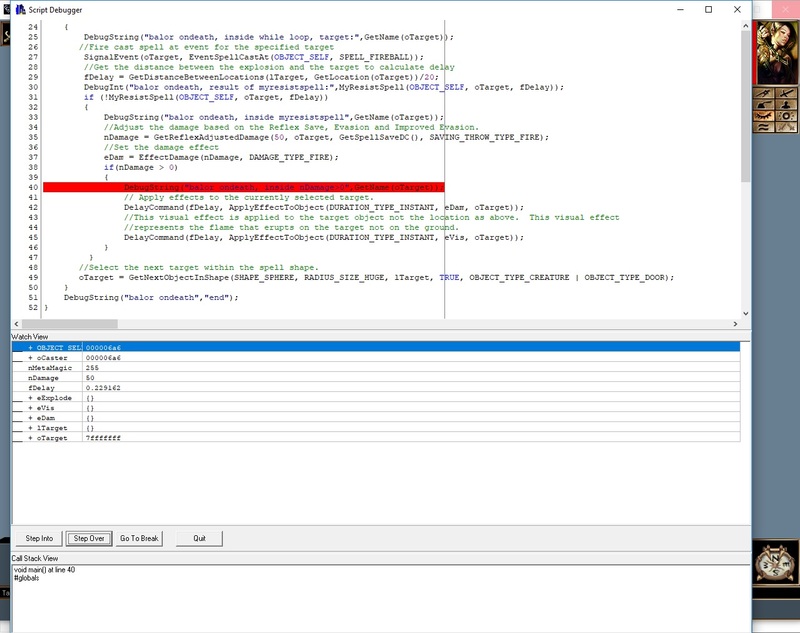 And the debugger will highlight currently processed line. The button Step Into will go deeper into custom functions, the button step Over won't. This is extremely helpful and much easier to use, it will show you values of all variables and when they change, it will show you which function runs and which doesn't. make sure you always remove the SpawnScriptDebugger(); command from your scripts after you are done debugging. toggle the Generate Debug Information When Compiling Scripts checkbox after you are done debugging.